3D printing has been making waves throughout the manufacturing industry for some time. Now Johnson & Johnson is looking to employ the technology to create bespoke body parts. Johnson & Johnson produced its first products in 1886 and was incorporated the following year. Founded by brothers Robert, James and Edward Johnson after the former heard a speech by antiseptic advocate Joseph Lister, the company expanded to become the pharmaceutical and medical technology giant it is today with a product portfolio that contains dozens of household name brands, including Tylenol, Neutrogena, Clean & Clear, and Acuvue. Today, Johnson & Johnson is one of the largest companies in the world and employs over 126,000 people. The New Jersey-based company has revenues of $71,890 million, and sits at #35 on the Fortune 500. 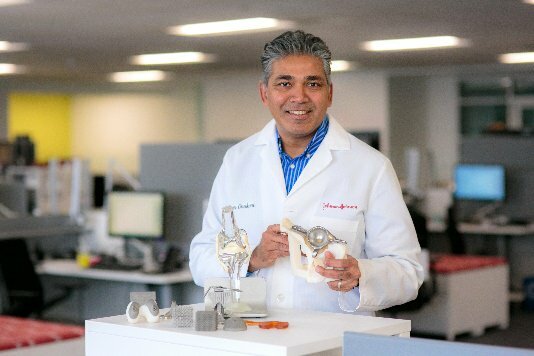 The greatest portion of Johnson & Johnson's business comes from the medical devices and equipment it produces for the world's healthcare organizations, and one of its greatest challenges comes when providing artificial body parts which are designed to replace the real thing in living bodies. The issue with traditionally manufactured replacement body parts is that surgeons and physicians generally have a set range of sizes they can choose from. Much like buying clothing directly off the shelf in pre-set sizes, it can often mean the patient does not get a perfect fit. With clothing, this may mean a slightly tight- or loose-fitting t-shirt or pair of pants, but with a replacement hip, it can mean the difference between being able to walk comfortably or not. 3D printing provides an elegant and cost-effective way to create bespoke replacement body parts which are made-to-measure for each patient. It is with exploring these possibilities in mind that Johnson & Johnson has opened its 3D Printing Centre of Excellence. Speaking about his own mother-in-law's double knee replacement, Sam Onukuri, Mechanical Engineer and Head of Operations at the center, said, "If there was a customized 3D-printed knee available then, I believe her pain and the recuperation time could have been reduced. Through 3D printing technology, we can print exactly what the patient needs to replace the degraded bone. The implant can be made based on a CT or MRI scan from thousands of miles away." The other issue with producing bespoke body parts for individual patients is that manufacturing costs skyrocket the smaller the quantity of the product that's being made. With 3D printing, this issue goes away entirely as the cost is the same - assuming the same cost of raw materials bought in bulk - for producing one item as it is when producing hundreds. Not only are production costs reduced, but the amount of room needed for manufacturing is also dramatically smaller. "To make products now, we have large factories that require a significant investment," said Joseph Sendra, Global Vice President for Manufacturing, Engineering and Technology at Johnson & Johnson. "With 3D printing, we can potentially move manufacturing to a very small footprint, doing the same thing closer to the customer. That means products do not need to be shipped as far, and there's a faster turnaround." It is the combination of cost-effectiveness and a smaller manufacturing footprint which has led many to proclaim 3D printing as the future of manufacturing. 3D printing has been around for almost three decades, but it is only now that the technology is really beginning to show its potential for transforming the way products are brought to market. Large established companies such as Johnson & Johnson are reaping the benefits, but so too are small startups. With 3D printing equipment becoming ever more affordable, small businesses are finding that the technology empowers them to bring their products to consumers faster, without the need to invest in sprawling manufacturing plants - giving even the smallest acorns the chance to compete with towering and established oaks. It may be too early to tell whether 3D printing truly is the future of manufacturing. However, with companies such as Johnson & Johnson applying it to better serve people in need of transformative surgeries, it certainly appears promising. The final word goes to Sam Onukuri. "Physicians make every effort to find the implant that fits best. But it's never a perfect match, and the same is true for the tools. As a result, the surgery takes longer - and so can healing and recovery - and the fit may not be perfect. We feel 3D printing will really help in the next years [when it comes to] helping our customers." You can hear Johnson & Johnson's Vice President of Product Supply Strategy and Development, Bart Talloen, speak at Connected Manufacturing 2018 this June in St Louis, Missouri.